There's a reason why horses are so prominent in art over the centuries. As well as being a significant part of war, travel and agriculture before the motor was invented, horses also symbolise strength, courage and beauty. Their lack of body fat exhibits their muscle structure, making them perfect subjects for anatomical study. During the summer, we will be meeting and drawing the friendly horses and ponies on Vauxhall City Farm. Mostly Cob breeds, these horses range in height and colour – some dappled black and white to lovely tan tones. We will be learning all about the animals and discussing some of the welfare issues affecting horses worldwide. We will begin with an in-depth introduction into drawing equines with plenty of tips and an overview of their anatomy. 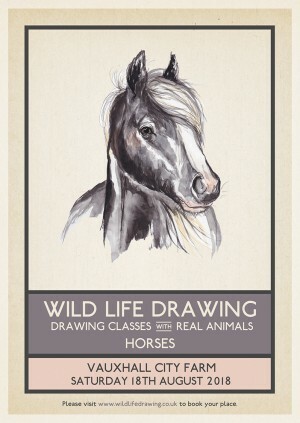 A brilliant drawing class for horse-lovers, animators or life-drawers looking for a new challenge! For this class we will be outdoors in the riding arena, so we'll be able to get a 360 degree view of the horses and ponies. Seating will be supplied as well as all drawing materials including paper and drawing boards, but please feel free to bring colours or any other specific media you might like to use. We'll start with some fun drawing exercises and plenty of practical tips to get everyone started, and creative guidance will be on hand all the way through the session. The aim of these drawing classes is to inspire a sense of appreciation and understanding for the animals and their conservation in the wider world. Wild Life Drawing is working with the finest animal handlers, sanctuaries and organisations to put on these events. All the animals that attend the sessions are well used to humans and different environments and are always accompanied by experienced handlers, their welfare is our highest priority. These horses are incredibly well looked after by the stables team at the farm and are very gentle – local children learn to ride on these horses and ponies. Though they get a nice summer holiday – when we draw them they'll have just come back from a month off!